In North Carolina, we love our craft beer and our luxury spas. Well, let's rephrase that sentence. I love my craft beer and luxury spas. Luckily for me, we have some of the best craft brews and luxury spas right in my backyard, so to speak. The Umstead Hotel and Spa in Cary developed an NC Beer-infused body scrub for spring in honor of the upcoming NC Beer Month this April. 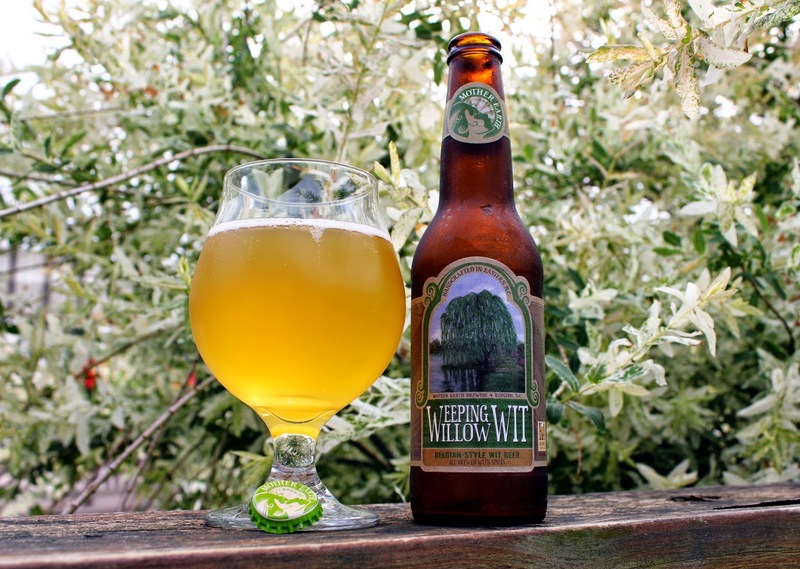 Spa Director Carolyn Doe developed this scrub recipe using her own favorite beer, Weeping Willow Wit beer from Mother Earth Brewing in Kinston. This body scrub will help soften dry winter skin, pull out breakout-causing impurities, and even help shield against harmful UV rays. This probably won't surprise you, but I happened to have the exact same beer in my own fridge, and all the other ingredients needed for this lux at-home treatment. In a mixing bowl, combine the Epsom Salt and Olive Oil. Slowly add in the Beer and wait until it settles in the bowl. Mix in remaining ingredients. Prepare a warm shower and gently apply the scrub in circular motions over your legs, exfoliating the skin to a smooth finish. Breathe deeply and absorb the gentle aromas. If you experience breakouts, apply to your shoulders and back to soothe and remove impurities in the skin. 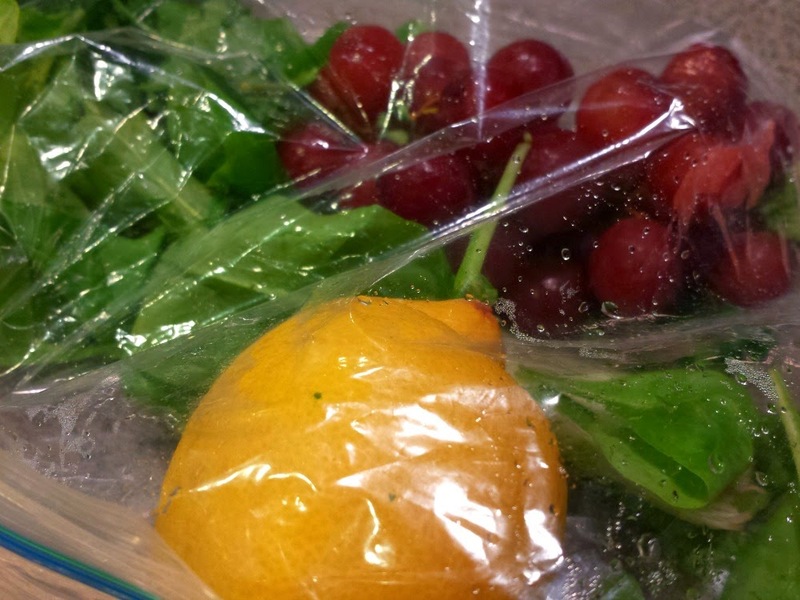 After each use, store the remainder in an air tight container and keep refrigerated. I enjoy learning about at-home spa recipes that I can use in between real spa experiences so I love it when the Umstead contacts me with tips. I was also excited to see a new use for Lemon Essential Oil. It is extremely important that you buy any essential oil from a luxury spa that sells therapeutic grade essential oils, a reputable dealer or manufacturer like Young Living Essential Oils because you want the the absolute best quality for the benefits. Never buy oils on ebay or Amazon.com because Young Living, a company that has been in business for over 20 years prohibits these type of Internet sales. You need to be confident that you are receiving therapeutic-grade oils and products that are indeed from the company. Since the Skimbaco Lifestyle team started the Enjoy Life Oils team, I have learned more about essential oils and really trust the Young Living's Essential Oils Seed to Seal quality commitment and am confident that I'm receiving high-end products delivered to my doorsteps. Since becoming a member, I have been creating many spa moments in my own home and I love it. You can learn more on the website Enjoy Life Oils, founded by my Skimbaco Editor, Katja Presnal. 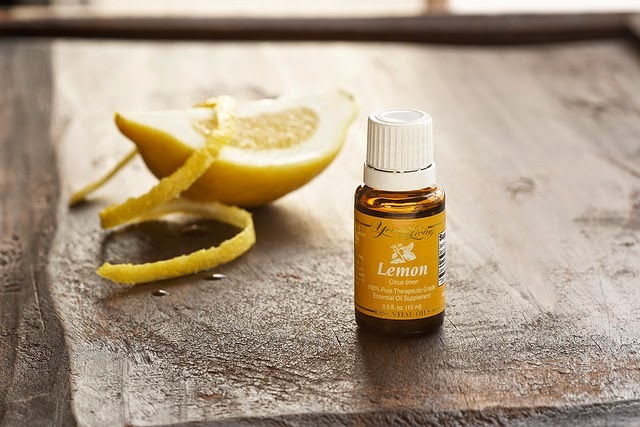 The Lemon oil I use costs $14.80 for 15ml and $11.25 at the wholesale/membership price. If you want to purchase Young Living essential oils today or join as a wholesale member to save 24% on all purchases including shampoos, vitamins, and supplements, visit Young Living and use my number 2481355. I'll be sharing some of my new health routines in months to come. 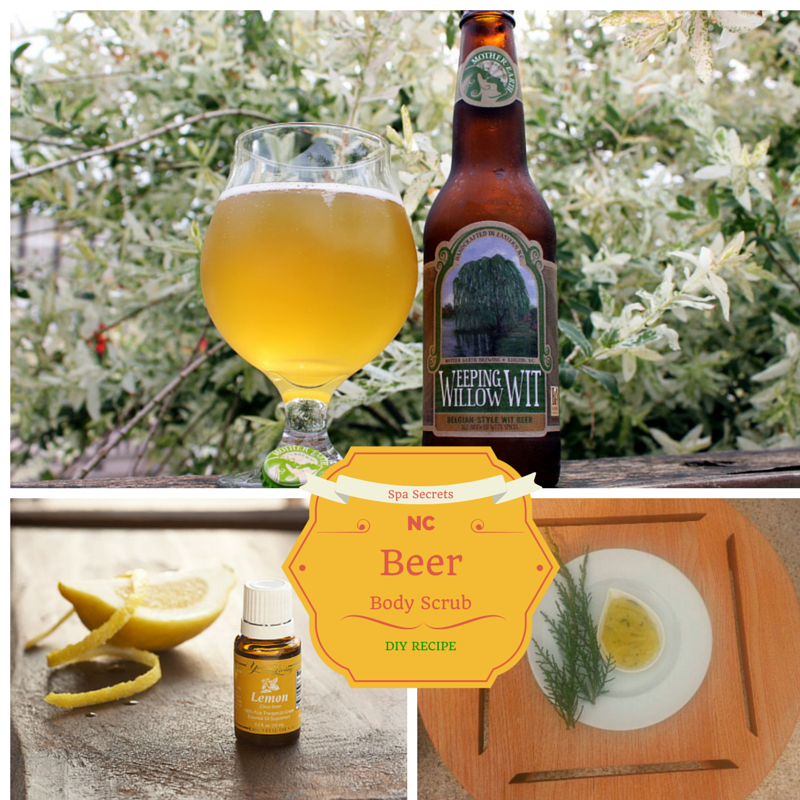 This spa treatment was designed by the Umstead Spa for NC Beer Month in April. It will not be on the spa menu, and it can only be enjoyed by you at home. Mother Earth Brews can be found all over North Carolina, Georgia, and of course, at the brewery in Kinston. Disclosure: This post contains affiliate links, and any online Young Living Essential Oil purchases will result in compensation. My goal is for you to live life to the fullest and for you to buy quality products either in your local luxury spa or with a reputable company like Young Living. Now go get pampered. 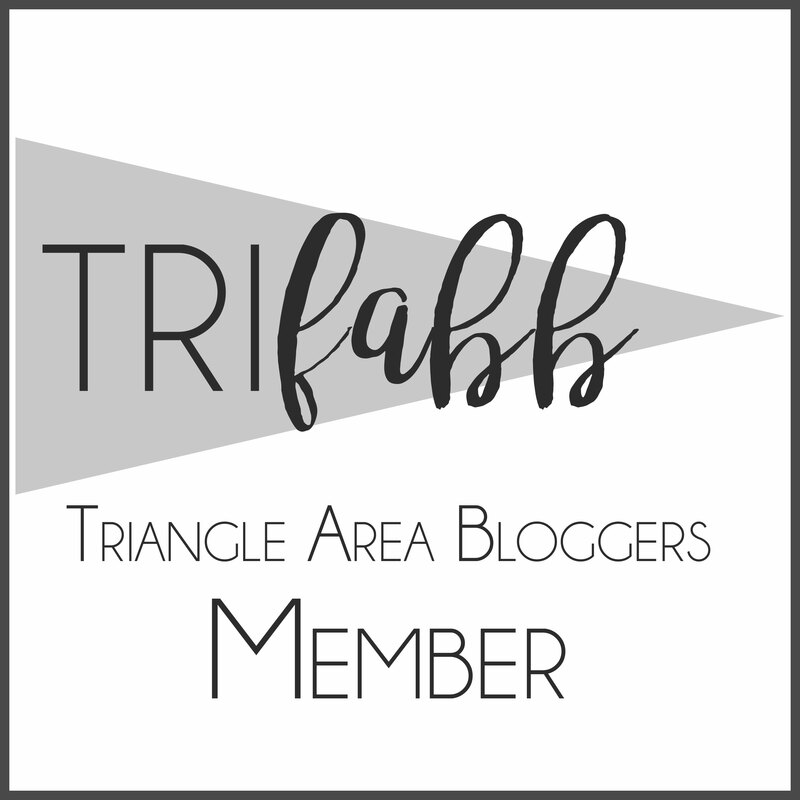 Linked up with Small Victories Sunday Linkup. I've been traveling this week so I did not have a lot of time to post much here this week. I feel like a hamster spinning on a wheel some days, and it almost seems as if I don't get much accomplished at all. There is always a new load of laundry to do. There is always a meal to create or little people asking for Pirate Booty to be placed in a bowl several times a day. There is always something new placed on my center kitchen island that makes the area even more cluttered. Just ask my husband about how I frustrate him with this. He finally had it cleaned off while I was in Pinehurst North Carolina speaking about social media in travel and tourism industry at the 2015 N.C Governor's Conference on Travel and Tourism, but once I returned, it became cluttered again. I did clear off a spot yesterday to make a new recipe kit from my Papa Spud's produce box, which arrives every Tuesday. As you know, I've been writing about cooking with fresh produce for a month now I'm what you could call "a new at-home produce delivery convert." Fortunately, for our farmers, there are a lot of these types of services in the Raleigh, Durham, Chapel Hill market. I'm not here to say one service is better than another because I don't know that information. What I want is produce at a an affordable price, flexibility, and great tasting food. My needs are being met by Papa Spud's. N.C is a top agriculture state and I want our farmers to thrive. These produce delivery services help to do just that, and I like it. I chose to become a Papa Spud's customer because it is the service I discovered first, and I gave it a try. It's really that simple. I've been a satisfied customer since my first order arrived in December, and I love how it has helped me embrace a new way of healthy eating via fresh produce. If you really start to change your eating habits, and how you buy produce from the store then I think there is room to use two services with different delivery days spread apart especially when more local produce becomes abundant. I supplement my produce now at a grocery store, and still my buy milk and eggs there. I could add those items to my produce box, too if I expanded with more credits. I love the idea of produce coming straight to my front door. I like recipe planning in advance while sipping coffee or wine at home. I like being able to pick the produce I want in the comfort of my home. The flexibility and choice selection with Papa Spud's are ideal for me. I do not have the energy to get dressed on a Saturday morning to try and find spaghetti squash for a recipe to only learn that spaghetti squash was at the market last week. With Papa Spud's, I know bok choy is available so I plan a recipe that uses that vegetable. Papa Spud's has a community that shares recipes for you to use as a resource, but the service also lets you order recipe kits as part of your weekly credits. These kits typically run about 6.00 credits. In the two months that I've been a member, I've ordered two kits and have loved each one The kit supplies the exact amount of things you need for the recipe and you are asked to supply staple ingredients like salt, pepper, olive oil, Parmesan cheese, etc. You will know exactly what you need to supply before you order the kit. 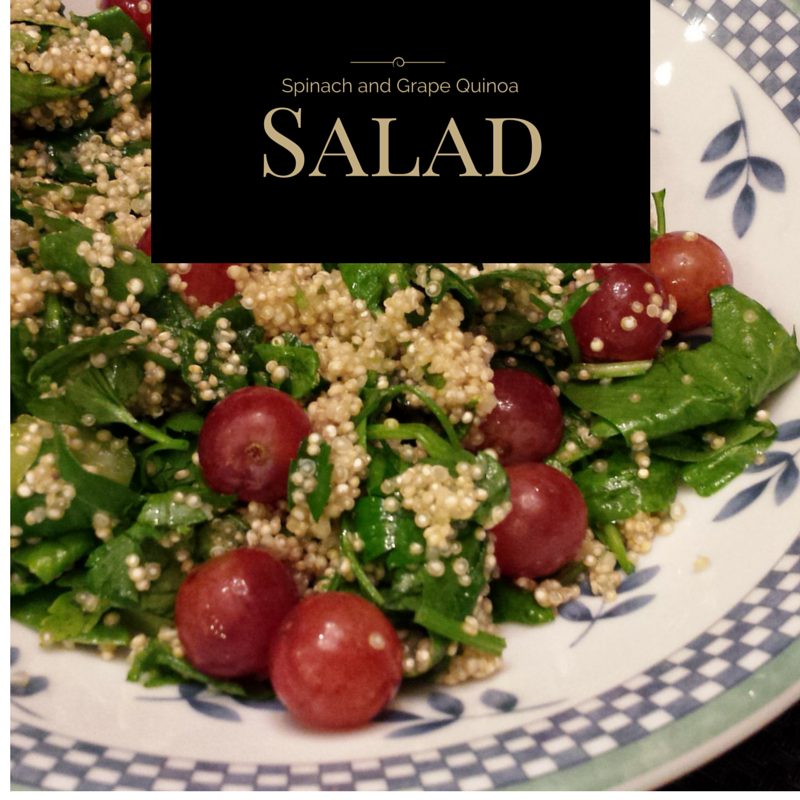 I ordered the Spinach and Grape Quinoa Salad kit this week. How many times have you had to buy a bunch of parsley in order to use just a little bit for a recipe. In my house, the parsley perishes before I can use it all because I didn't plan three recipes with parsley as an ingredient. 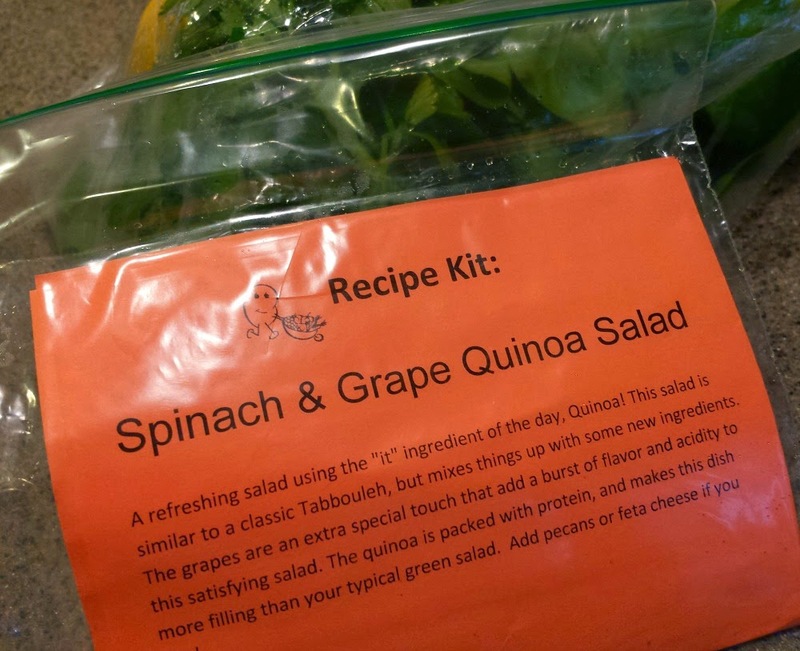 The recipe kit eliminates waste in the kitchen, which in turn cuts your costs. This particular recipe kit serves two people. You could increase the quinoa amount, and adjust the seasonings accordingly to make larger serving. Rinse quinoa. Prepare as directed. You could also increase amount here. The 1/4 cup does not produce a lot of quinoa. 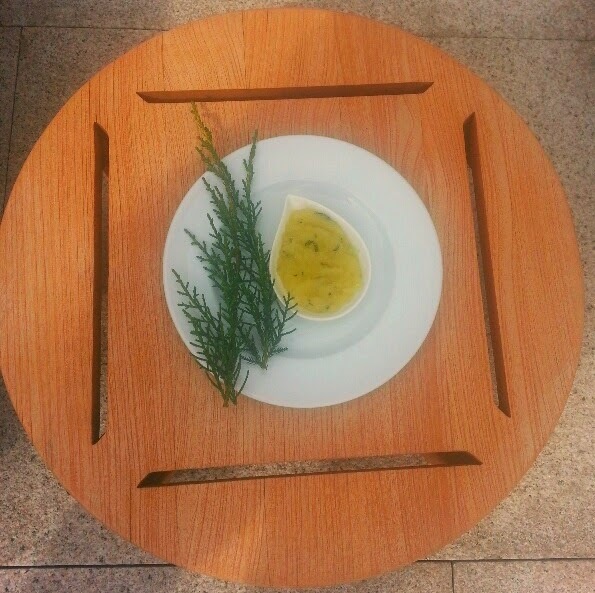 Combined fresh squeezed lemon juice, olive oil, salt, and garlic in bowl. Mix well. Pour mixture over quinoa while it is still warm. Add spinach, Italian parsley, and celery. Mix well. Season with salt and pepper to taste. Chill for 30 to 60 minutes. 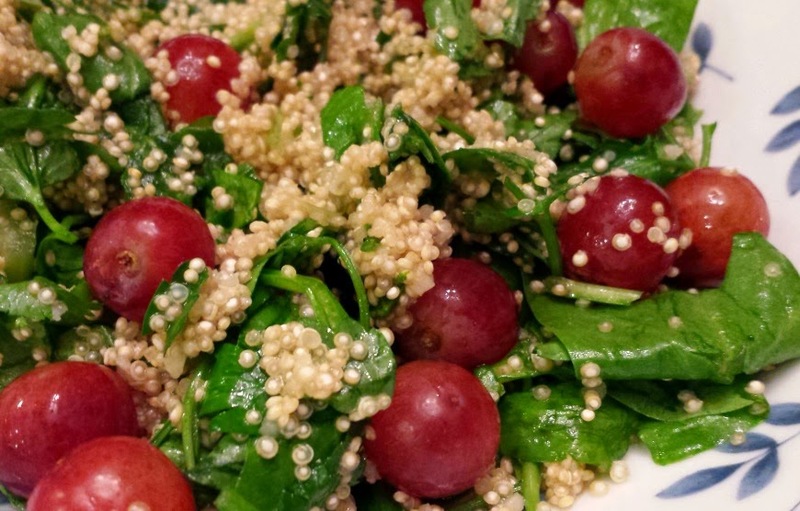 Serve quinoa salad topped with whole red grapes. Add pecans and feta, if desired. And on a side note, I had never ordered grapes before from Papa Spud's, and if grapes are available this week, I am going to order some because they were crisp and delicious. I am really excited about the upcoming months because spring and summer is our peak produce months. It's only going to get better. 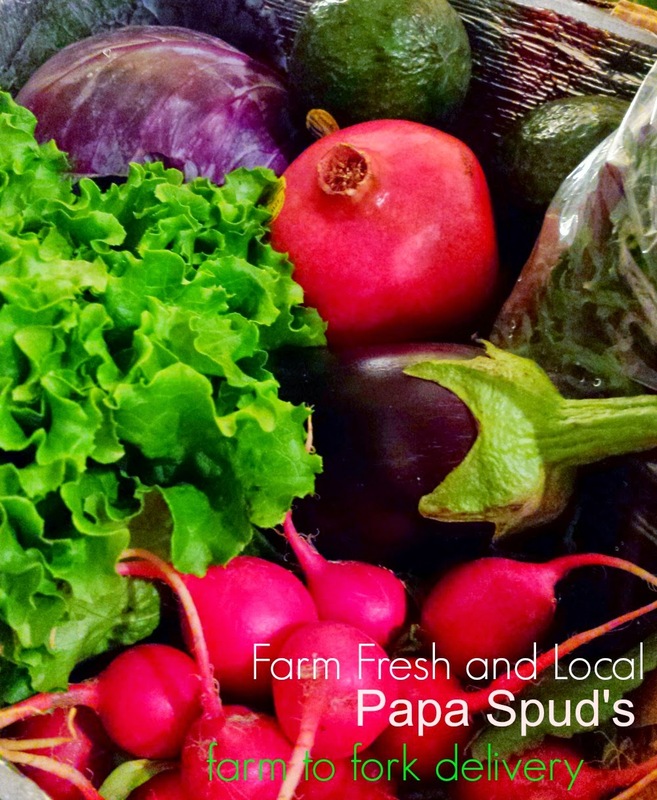 If you want to sign up for Papa Spud's at-home produce delivery, please use my referral link. 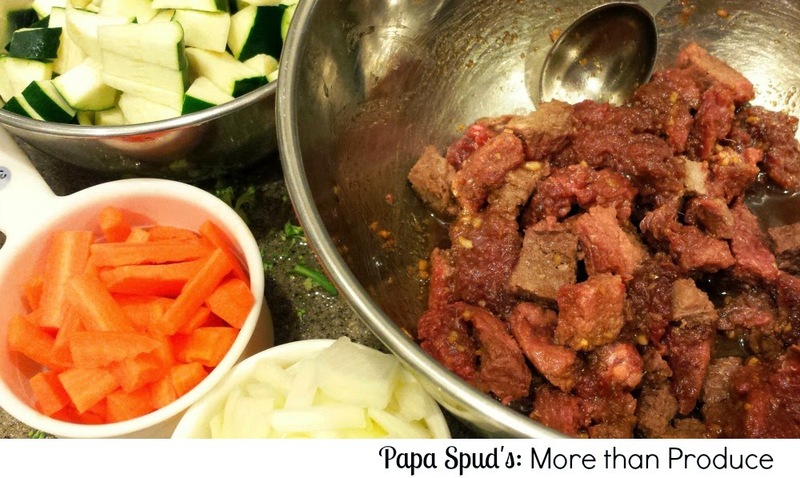 My thanks to Papa Spud's for sponsoring this cooking series on the blog. My opinion of the service was not influenced by the sponsorship. I was a satisfied paying customer before the sponsored series, and I will continue to pay to use the service. I will share more recipes in the future and will share my referral link. Every member of Papa Spud's has one. If you join, you will have one, too and can earn additional produce credits if someone signs up within 30 days of viewing the link. Be sure to follow my Pinterest boards, for produce-inspired recipes. It's Friday, and I'm about to sit down and customize my at-home produce delivery with Papa Spud's for next week. 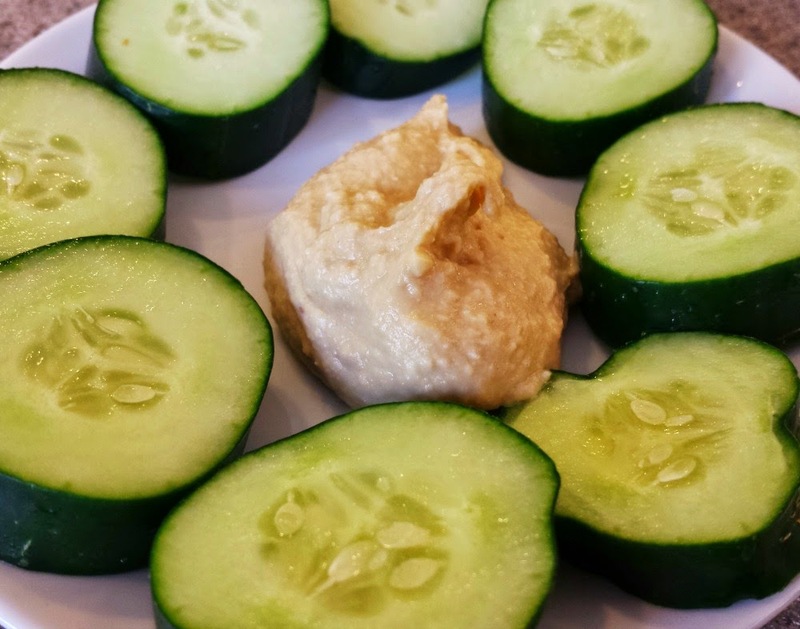 In case you have missed any post in this series, all you need to know that I started ordering at-home produce delivery at the end of last year, and it has been a life changer for me. Going with an at-home produce order service was certainly a new type of experience for me. Let's just say it perhaps took me out of my cooking shell a little bit. First off, I'm not a true foodie.I don't even try to be.Yes, I interview some of the best chefs in the world and dine in top resorts for my travel writing, but I'm just an ordinary person who likes food. I have friends who are true foodies, and when I'm with them sometimes, I feel as if they are corresponding in a foreign language around me. 1. Was the food good? 2. How much did the meal cost me? 3. Am I eating good, whole foods? 4. Is the dish worth the calories? That's basically it It's pretty simple. I go about getting my at-home produce the exact same way. I look at what is affordable for that week. I make a meal plan, and order my items based on my weekly meal plans. I basically plan those meals after I see what is available at Papa Spud's. After I complete my order then I go to a regular grocery and pick up anything else I may need. My favorite lunch. 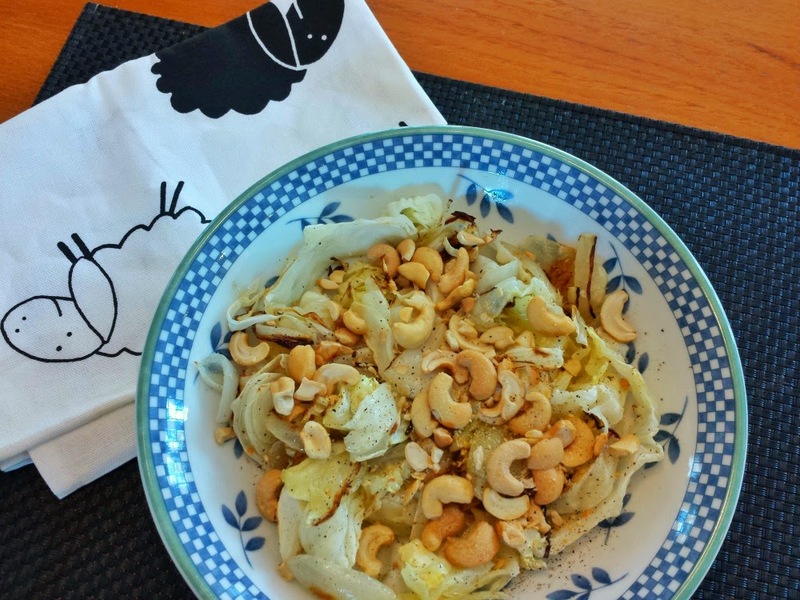 Roasted cabbage with cashews. Toss in olive oil, garlic powder, salt, and pepper. Roast for 20 minutes at 400 degrees. To recap, I order a regular size box weekly from Papa Spud's. At $23.69 weekly, that includes 20 food credits. That price can get you a good amount of produce, but it's not enough to get you a lot of produce plus some of the extras that Papa Spud's offers its customers weekly. Papa Spud's offers dairy, eggs, cheese, organic meats, seafood, chocolate, specialty items, pastries, breads, grains, and pastas. The variety that Papa Spud's offers it customers is fantastic.It also changes based on demand and suppliers. For example, I knew I was entertaining one week when I first joined in December so I ordered the Honey Fig and Goat Cheese from Hillsborough Cheese Company to use an an appetizer. It ate 5.50 of my credits for 4 ounces that week. It was fantastic and it was worth the splurge that week. I would gladly do it again for a special occasion. With my 20 credit limit, I stick to the produce basics, but I do order organic chicken thighs and legs quite often in my order. It's great-tasting naked chicken from Joyce Farms, which is headquartered in Winston-Salem, N.C. I order the legs and thighs because they are affordable for my credits. My kids love drumsticks, and one pound of chicken legs equal 3.00 in credits. I am able to get meat and lots of produce with a 3.00 meat credit price. That's a win in my book. Since working with Papa Spud's this month to help share my experiences, I've been given a few extra credits to experiment with on my orders. But, I'm not going crazy with them. The past few weeks, I've been averaging about 34 to 37 credits weekly, which is a good 15 credits over my typical allotment that I signed up for in the beginning. It's higher because I've been getting more meat and pasta with an occasional sweet treat. The mini loaf from JP's Pastry. 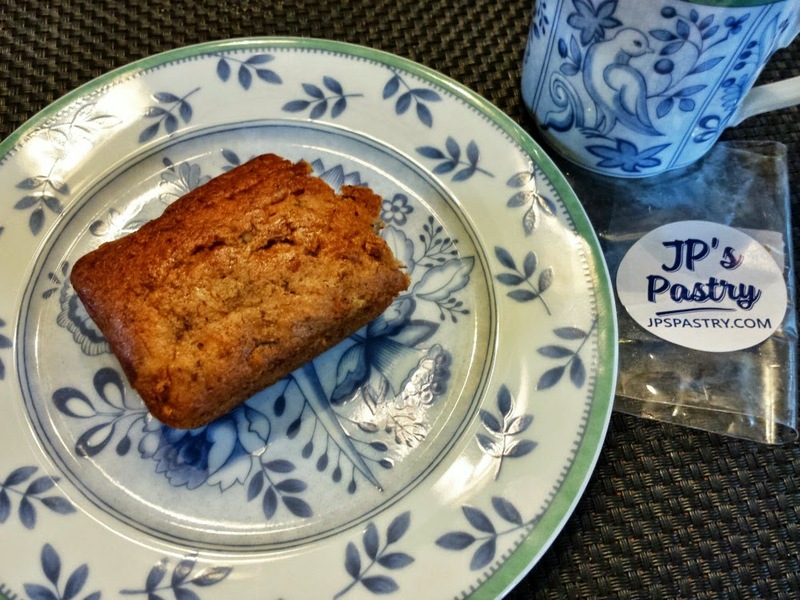 Last week, I decided to get a mini gluten-free banana nut bread from JP's Pastry, an online gluten-free wholesale bakery in the Raleigh area. I can eat gluten, but the bread sounded tasty so I thought I would try it for a breakfast for the kids. I had the extra credits so I decided to use 4.00 extra credits to get the one mini loaf as it was named. When it came on Tuesday, I giggled because it was certainly mini or smaller than I had expected. I think I was expecting a small loaf that would feed a few people. The mini-loaf equaled in size to an oversized, large muffin. No one else ate that loaf, but me because they never had the chance to see the loaf. I devoured that mini loaf like I had never eaten sweet, wonderful bread before. It was probably one of the best breads I have ever tasted. It was simply delicious. Would I purchase the mini muffin loaf again in my box? Maybe, for a special treat, but the price of the one muffin doesn't warrant the splurge from what I need to get out of my produce box weekly. My overall goal has been trying to reduce my regular grocery store items so I need to stick with items that I can use for meal planning. You can, however, buy additional credits with ease each week if you needed to do so. However, for this particular item, I'm more likely to take a coffee break in one of the coffee shops where the breads are sold locally. I would like to enjoy that expense along with a nice conversation with a friend. Muffins at that price range are still more about the overall, dining experience for me and I'm not ready for that type of personal expense at home. I really don't need the extra calories either, and one muffin would not feed the kids either. I would have had to get 2 muffins for 8.00 credits and that is just not a good budget move. When this series is over, I am seriously thinking of moving to the Family Size Box of 40 credits at a cost $45.09, which includes delivery and taxes. I think it would be the best bet for my family especially now that I've gotten used to how the system works. You don't have to use all your credits in one week either. They do carry over credits weekly, which means you can go out of town, and hold your order. Papa Spud's partners with many local suppliers, and eventually I would like to replace some staple items like honey for Wake County's own The Pleasant Bee honey. I order Melina's Fresh Pasta quite regularly now. It sells out very quickly, but I was able to snag some of her ravioli last week that I've not tried yet. This week, I'm sharing one of the recipes I cooked from Leigh is Cooking with Farm Fresh Produce Boards. 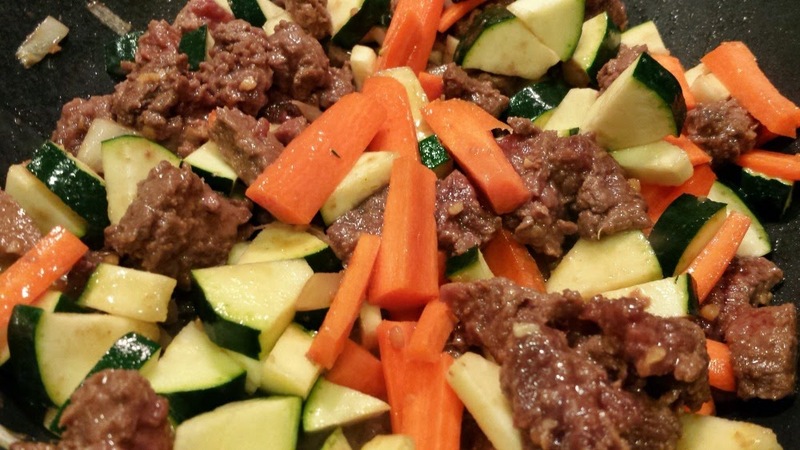 I prepared this Korean Beef Rice Bowl using sweet potatoes, carrots, zucchini,spinach, onion, and grass-fed beef which was about 8.00 credits for one pound. This recipe was a Pinterest winner. I loved it. My kids complained. They said the sauce was too sweet and I had to make them cheese toast. If you want to sign up for Papa Spud's at-home produce delivery, please use my referral link. I will be concluding my weekly series next week, and we'll be talking about the recipe kits that Papa Spud's offers. Disclosure: Papa Spud's is sponsoring this special cooking series on the blog. I am a Papa Spud's customer, and will continue to be a paying customer after this special series is over. I have been very pleased with all of my orders. It's #IGTRAVELThursday. I always get a little giddy when a new hotel opens, and I get even more giddy when a new hotel brand debuts in my home state. 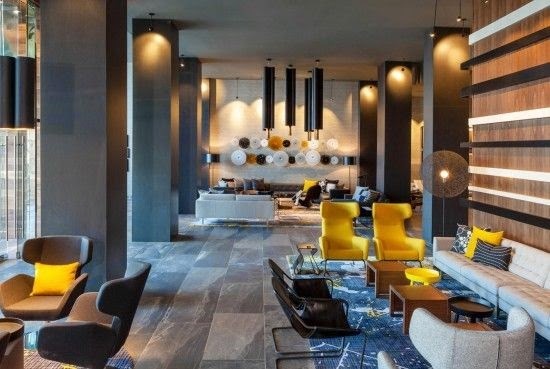 We now have our first LeMeridien hotel in North Carolina. It's located in Uptown Charlotte. 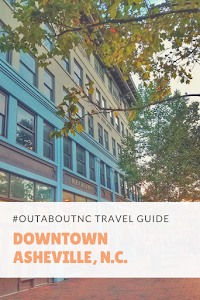 Charlotte food blogger, Chrissie of Off the Eaten Path, tagged several great photos for my NC travel community #outaboutnc (read more about this community on Skimbaco Lifestyle today) while attending the hotel's grand party festivities yesterday. 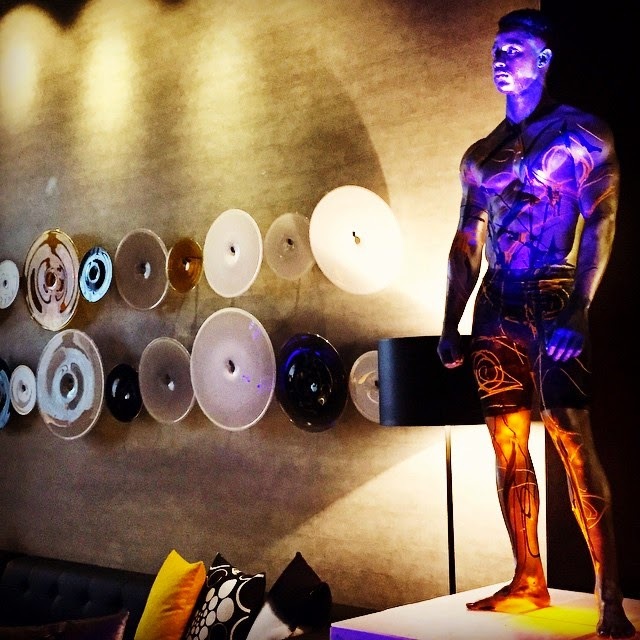 LeMeridien has European roots, and the decor for this particular hotel is quite different from what I would ever put in my own home, but that's why it intrigues me. I feel as if if checking in would offer a different experience outside of my normal daily living, and it gets to the core of what I love about hotels so much. I've said it 100 times, if not a 1,000 times, but hotels are about experiences. They are not just places to sleep. They can be so much more. A hotel is part of the destination experience. They are the vehicle that can make your travel destination go from ordinary to extraordinary. And according to Chrissie, LeMeridien knows how to party. Something tells me that this man or robot or mannequin isn't always standing on the table. Actually, they called it #LMArt. Very interesting, indeed. 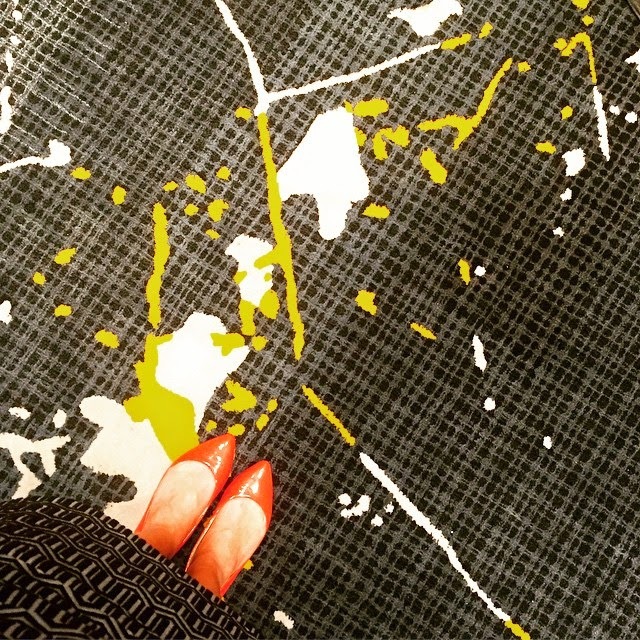 And there was a woman on a table, too, But, I'll let you check that photo out on the official @LeMeridienCharlotte IG account. I look forward to a visit myself one day. I heard they had good coffee, and an indoor salt water pool. If you attend a yoga class at a gym there is a good chance your instructor was trained by YogaFit©, Inc. the largest Yoga School in the world. This school, founded by Beth Shaw, has trained over 250,000 fitness instructors over six continents. 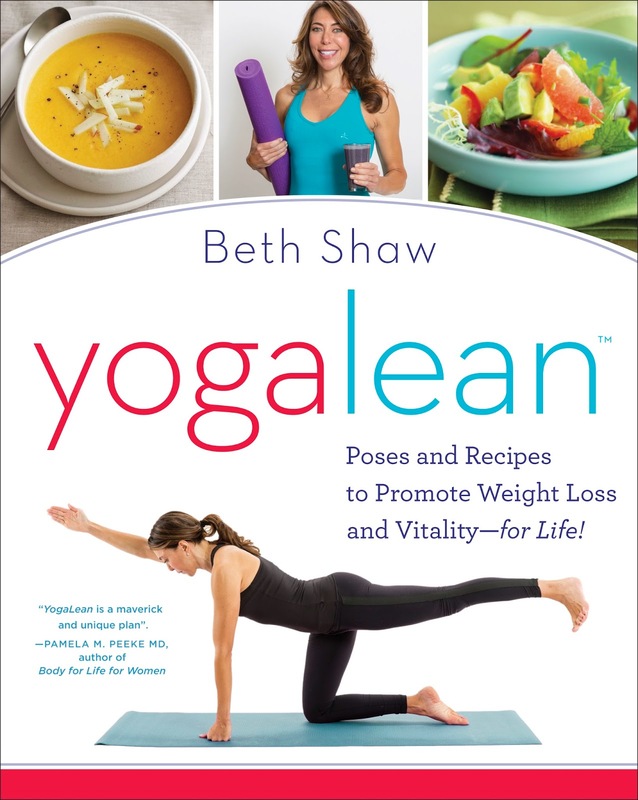 Beth's Shaw's first book, YogaFit, has sold over 100,000 copies worldwide. 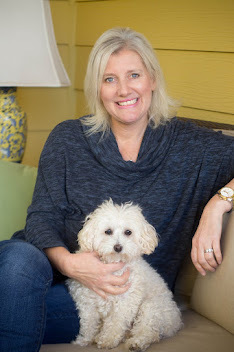 This winter, Shaw released her second book, YogaLean. For this book, Beth focused on nutrition and the right tools to jumpstart your weight loss and good health goals. Fully illustrated yoga poses that promote a lean physique, strengthen your core, increase energy, improve balance, boost metabolism, and enhance confidence. A menue of cardio and weight-training workouts that complement your yoga, refine your physical strength, and ward off disease. Easy recipes (gluten-free!) and simple suggestions for breakfast, lunch, dinner, and snacks that will help you burn fat more efficiently. A one-week jumpstart plan outlining precisely what to eat and how to exercise your body and mind! Beth sent me one of her favorite recipes to try. It's called her Immunity Soup and she says she uses it anytime she starts to feel run down. I prepared it during our ice and snow storm last week, and I loved having it for lunch. I was not feeling rundown, but I wanted a good warm, hot lunch option. The main ingredient in this soup is garlic. 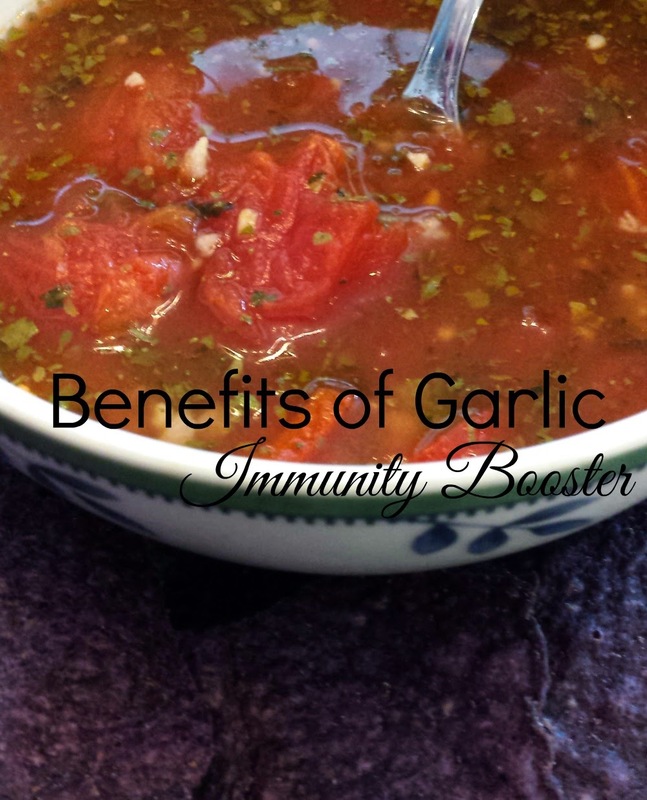 "Garlic is an immunity strengthener/saver. It has been called a natural antibiotic because it triggers bacteria and viruses and on its own has high levels of manganese, calcium, vitamin B1, Vitamin B6, Vitamin C, Phosphorous, copper, potassium, selenium, and tryptophan," said Beth. She makes this soup often in addition to taking garlic supplements. 1. In a stockpot, bring broth to a slow boil. 3. Add the cilantro, tomatoes, and lemon juice to the broth. Lower to a simmer and mix in the garlic, peppers, and remaining cumin. 1. Add brown rice if you would like carbs. I liked the soup. I would best describe it as a spicy tomato soup. I will say that my breath would definitely keep some vampires away after having it for lunch. It certainly caused my daughter not to kiss me with her very keen sense of smell. She said, "your breath stinks." This soup has intrigued me to see more recipes in the book. This post is not a book review because I typically don't do those types of stories. As a result, I also did not receive an advance copy of the book. I did, however, ask to give her new book, YogaLean, to one of my readers for you to enjoy. Am I intrigued to buy this book myself? Yes. I want to see more of her recipes, and I look forward to browsing through it the next time I'm at a bookstore. I hope the winner of this giveaway checks back in with us, and lets us know more about the book once they receive it.